Weight loss has got to be the most frustrating experience for many people, young and old alike. Eating foods that are just horrible, denying yourself foods you truly love and enjoy. Exercising, even though you absolutely hate exercising, and end up stiff as a board with no results. At some point, you start questioning whether you can last so much as one more day on this regiment from hell. Adding to the stock pile, you metabolism is getting ready to pull the floor boards right out from under you! It's searching for little sneaky ways to start storing that fat you are trying to get rid of! Believe me, I know exactly how you feel, I've been there many times myself. I would continue my quest to find the"perfect" weight loss program and start seeing great results. Unfortunately, until now, all these programs have been nothing more than pipe dreams -- pie in the sky. What if I were to say, you do not have to continually abuse yourself and still lose weight with a happy, productive metabolism to boot? I am going to share some amazing secrets that will increase your metabolism, allowing your body to turn into a fat burning furnace day after day. First off, you need to break weight loss down into two totally different and separate components and address them individually. Your first component is dealing with your under active metabolism. An active metabolism will allow you to eat anything you wish in Phase One and still lose weight! The second component is forcing your body to continually burn unwanted fat, as a fat burning furnace it should be. When you start reducing your caloric intake, your body will flip the switch and start massively attacking fat. You will never have to deal with those traditional weight loss programs, ever again! 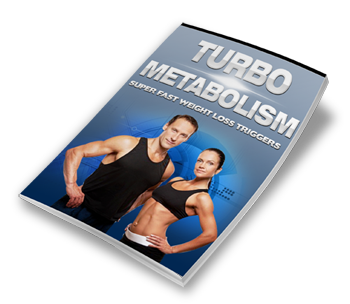 Turbo Metabolism is the easiest and most manageable approach to weight loss to master. I guarantee your weight loss will be fast, fun and very easy with Turbo Metabolism, which is a completely different approach to healthy living! techniques that turn you into a pretzel. contrary to scientifically proven facts. months to get great results. You Want Fast, Effective Results! You will NOT be overwhelmed with unnecessary programs that require, calorie counters, glycaemic indexes, meal plans and, of course, those unattainable exercise regiments. So many weight loss programs are literally developed to fail. They force your body to lose water and muscle, not fat. The downside to these two facts are: Your body needs water, it is essential for your overall health. The loss of muscle removes the ability for your body to tone up! Fat, on the other hand, is not good for your heart and should be kept down to a controllable level. When you lose fat, you see immediate results in your stomach, love handles, hips and thighs. You also receive more energy and an overall feeling of good health. The problem with many weight loss programs is you are starting both components at the same time, on the same day. This causes an extreme overloading for both your body and mind. When this happens, there is only one outcome -- TOTAL FAILURE! So many of these programs are developed and designed by sculpted fitness fanatics who spend most of their lives in gyms. These authors devote their entire lives around body building and workouts, and expect you to have the same devotion and commitment as they have. Unfortunately, many of us do not want to body build and spend our time in extensively, painful workouts! I will be completely honest with you: If your ultimate goal is to be on the cover of Muscle or Fitness magazine, as Mr or Mrs Universe, Turbo Metabolism IS NOT FOR YOU! On the other hand, if you are someone who wants to lose weight quickly and see dramatic changes in your overall appearance, Turbo Metabolism is definitely for you! If you want to feel better than you ever have, and enjoy feeling extremely healthy in your personal life, family life and work life, then this program will change you forever! Turbo Metabolism will speed up weight loss and ensure that loss is in the form of All Fat -- Not Water -- Not Muscle. But don't take my word for it, try it for yourself. 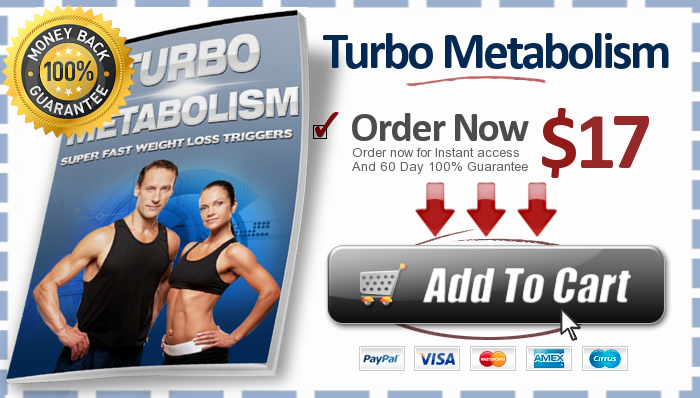 You can download Turbo Metabolism right now & try it risk free for 60 days. If Turbo Metabolism is not everything I say it is I'll offer you a complete refund . You will no longer be able to blame your slow metabolism for your excess weight. Once you receive your copy of Turbo Metabolism, you will start speeding up your metabolism from day one and start seeing incredible results! Save 50% off regular price for a limited time! Click on the book cover below to order this digital e-book from our digital partner E-Junkie. 50% Off For Limited Time .... ORDER TODAY! © Copyright 2018, EatandGetSlim.com. All rights reserved. DISCLAIMER: This site contains information which is intended as information only. It does not constitute medical or financial advice and users should consult an appropriate professional about any information presented here to determine its suitability. Any names used on this website should be treated as pen names of real people unless otherwise stated.